The Chakri dynasty is the name given to the succession of kings of Thailand since 1782. Thailand being a constitutional monarchy, these kings are still on the throne of our day, although they have little real power. They all bear the same name of reign, "Rama". The founder was Rama I, his successor was Rama II. The current king is Rama X, he took office in 2016. 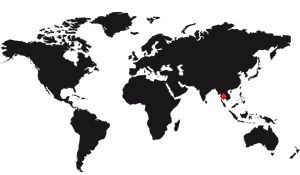 This dynasty has experienced two major events in its history: The transformation of the regime of absolute monarchy into a constitutional monarchy (in 1932) and that of the Kingdom of Siam in the Republic of Thailand, in 1939. But these two events should not be forgotten that it is the foundation of this dynasty, in 1782, which is at the origin of the creation of the city of Bangkok. Like everywhere in the world, when a royal dynasty is constituted, it is because the previous one has disappeared. There may be several reasons for this, most of the time it is a reversal of the regime in place. Sometimes, it is a legal reversal, as the fact that a succession can be done, in some countries, only by the men and that the last sovereign had only girls. Sometimes also the establishment of a new dynasty is due to the chaos engendered by a revolution, a popular uprising. In the case of the Chakri dynasty, it was a military defeat that triggered the process, and a coup that ended it. Before these events the situation was relatively simple. The ruling dynasty was that of the kingdom of Ayutthaya, a city currently 60 km north of Bangkok. It was a kingdom founded in 1351 whose territory took roughly the current Thailand, to some regions of the North and East near. This kingdom obviously had many avatars, but the constant struggle with the Burmese neighbors provoked the war too much. In 1767 the Burmese seized the capital and partly destroyed it. The king died and his son Taksin, who participated in the defense of the city, managed to escape. The kingdom was then cut into six, Taksin becoming the king of Thonburi, a town west of Ayutthaya. He was followed by General Thong Duang, his friend. In 15 years Taksin took over a large part of his country, he unified and developed his economy. But in 1782 he was declared insane and was executed by Thong Duang on April 7th. The latter then took his succession under the name of Rama I. Thus the ephemeral kingdom of Thonburi came to an end, replaced by that of the kingdom of Siam. When he came to power Rama I organized his kingdom differently. He moved his capital to Bangkok, a city created ex-nihilo on a surface south of Ayutthaya. 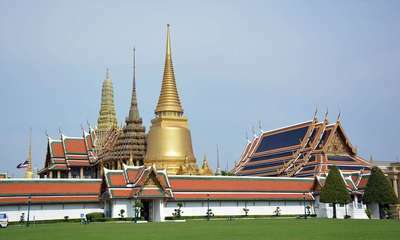 He built a royal palace near which he installed a temple to house the Emerald Buddha, considered at that time as a spiritual object all important. Rama I continued the work of reunifying the kingdom by presenting unpublished legislative texts and recompiling the Ramakian, the Thai national narrative. It is a set of texts based on the Ramayana, a set of popular as well as legendary Indian stories that had been imported by merchants at the end of the 1st century. By rewriting it and installing it in the Thai environment, this text became a national narrative that cemented the future nation. Otherwise, Rama I fought several times against the Burmese who tried twice to take Ayutthaya. Learn more about Rama I.